How to avail an instant discount of Rs 30 on Rs 303 and Rs 499 plans of Reliance jio via Paytm? Reliance jio has made a strategic partnership with Paytm that facilitates its subscribers to recharge their mobile numbers via Paytm platform. Earlier jio subscribers are only able to recharge their mobile numbers via jio.com or My Jio App. The Happy New Year offer is going to end by March 31 and Mukesh Ambani made an announcement of prime membership for customers who join before March 31. Prime members can enjoy the benefits of Happy New year offer till April 2018 by doing a monthly recharge of Rs 303 or 499 and with a one-time subscription fee of Rs 99. Jio servers crashed owing to the tremendous amount of traffic it incurred on March 1, the first day to enroll for Jio prime. Jio subscribers base has recently crossed 100 million users. This made Reliance Jio look out for alternate payment solutions and has now tied with wallet provider Paytm. Paytm is offering instant discounts when you recharge for reliance jio subscription plans via Paytm website or Paytm App. If the Jio users fail to enroll Jio prime membership scheme then they can enjoy regular non jio prime plans.Reliance Jio has announced the various plans for Jio prime customers and normal customers. Paytm is offering an instant discount of Rs 30 if you recharge your jio number either Rs 303 or Rs 499. 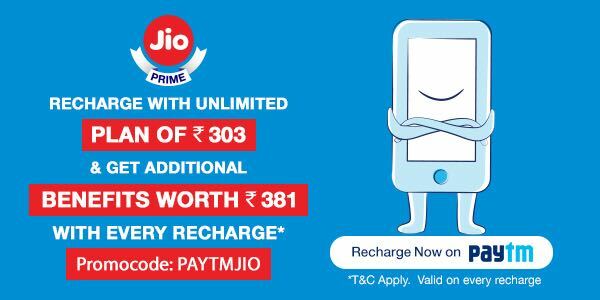 Apply Coupon code PAYTMJIO while recharge to get instant Rs 30 off on Rs 303 and Rs 499 plans.